I've been looking at the game's customization rules for creating your own characters/units (First Edition has a "Build your Own Hero" style chapter.). This got me to wondering if anyone else has created custom characters? Maybe recreated the Marine squad from Aliens or other unique characters from the universe? I've been toying with the idea of doing the same. I'd like to create an Ellen Ripley figure and stat her out, Herk Mondo, Amanda Ripley, Alexa Woods (After all, already got a Horrorclix model of her that I rebased for this game a while back.) a Berserker unit, and a few other things. Basically what I am doing here is two fold: 1. I'm seeing if anyone has dabbled with the customization rules to create their own characters, and if so, how things turned out for you. Did things need a bit of tweaking, or were they good as it? Does the conversion between first and second edition have an effect on the character creation rules? and 2. Does anyone have suggestions for models that are both size appropriate, and accurate to different characters or vehicles within the AvP universe? Not sure when I'll get around to it, but I'll plan to share whatever I come up with when I get around to working on this. I haven't actually started statting anything out yet, but I have found a few substitutes I'm hoping to convert for different units. I was thinking I'd start with a head swap. From there, I was thinking of placing a running board and handle that would allow additional passengers to hold on (The book says it can carry two passengers.) then maybe make some kind of addition to the front of the vehicle to make it look more appropriate to the predators. On the grounds that the books and comics imply a wide range of build styles for their vehicles, I figure if there's ever an official model made for this game, I'll still be able to make use of these. I think its going to be a little on the small side, but it looks closer than most anything else I could find online and is by far the most cost efficient way to add them to my army. I'm kind of torn on whether or not they should fit on a 40mm or 50mm base, but on the grounds that the Power Loader is listed as a "Medium" base and the Exosuit is listed as a "Large" base in the Unleashed book, I think the larger base size is probably correct in this case. Also, I'm still considering if I should do some kind of head swap. From the pictures I've seen online, they look similar sized to the Predators over the Human models, so at least they look to be on a similar scale to the power loader. Surfing on the internet, I saw something that came as a surprise. 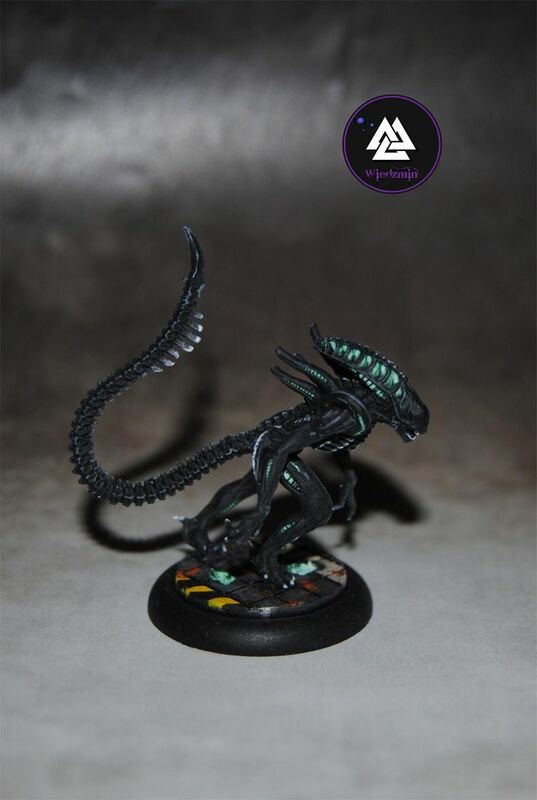 Someone had taken a Alien Warrior model and painted it. (Picture above is the one I found, I have not yet tried to make my own this way.) The head ridges all got painted in shades of green, with the rest of the model being painted the normal black. It looks nice enough that I'll be trying something similar in an effort to put together a couple of small units of spitters. Best part is that if an official model is ever released I can keep the models that way to use as a unique Warrior unit later. The "Capitol" range of miniatures for WarZone has a lot of models that look like they could act as Mercenaries, or a couple of them might even work as Marine Heavy Support models. I think the model I am most anxious to find a proxy for is Hurk Mondo (From the comis: Alien: Colonial Marines, Mondo Pest, Mondo Heat.) which I intend to put together some unique stats for, and also to use as a Heavy Support model. Been looking around ebay, but still haven't found anything close yet. Anyone else come up with ideas for either substitute models for things that don't already have an official model, or customs? I am very interested to know if you have tried making custom characters with the rules for expanding your forces/characters. I just found Prodos Games and bought the "one of everything" package with a few others. Going all in was not a hard move as I have been looking for 28mm AVP for ages. Not sure how I missed this game. That being said, I am very keen on getting some insider details from people that have had time with the game. Jumping back in to AvP and I have some planned conversions. Use Youngbloods as a base as two have alot of armour and AvP extinction design had full armour. Bulk them up so the stand toe to toe with a Elder predator size wise. Turn dreadlocks into cables going into armour or hide as these units had no exposed flesh/hair. Claws filled or covered. Add back mounted weapons maybe steal from larger scale predator figures? Paint the flesh and netting as metal for a full body suit look. Two options as their ships show their tech carries in style and appearance. First is base the bike off of the Neca figure Blade Fighter or a smaller predator ship. You can buy a Plasma Caster or Ship the right scale for a basis for these. Option I want to go for though is using Gate of Antares Freeborn Skimmer. Use a magnetised top half predator to swap out the pilot (with the lance weapon), this means if bike is destroyed you can pop him on his legs. Remover the gunner and create space for two predators to be magnetised on as they hitch a ride. Once again stealing a neca figures plasma caster and popping it as the front underslung weapon. Add a trophy rack and boom paint silver. For the Gunship I've seen a few nice kits of right scale Predator ships that I'll just grab one of those. Once my expansion and clear preds arrive I will start my new clan and post pictures of the conversions. I'll post pictures once I have the tracker predator but I made a simple falcon drone to use instead of the token. I used part of a GW Eldar back aerial for the nose and eyes, then trimmed down some Genestealer hands for the wing scutes. Very simple but once painted and put on a flight stand should look the part. Excited to see what you came up with! I ordered up two of the new expansion. Pretty excited to see it arrive. Thanks. My expansion box should arrive Monday so should be starting properly with my conversions. Any plans for the models in it? I don't have any specific plans for any of the models just yet. Like yourself, I'll likely do a conversion of some form with the Tracker just to help make them stand out from one another, but I haven't put much thought into the rest of it. As promised here is a picture of the drone. I'm going to photo blog my project via a seperate Instagram account for ease. Any useful ones I'll link on here for others use. Posted up a picture of the bike I'm using as a hunting bike with the gun moved as the underslung plasmacaster. I'm very happy with it. My Predator Gunship arrived so here is a picture with size comparison. I would be interested in seeing some of the Mech Suits from Aliens lore, including the Berserker and AvP2 Exosuit. I always liked the Berserker comics, would love to see those done as well.